Scenes from the 56th parallel north. The State Hermitage Museum. Somewhere around 3 million pieces of art spread across more than 1.000 rooms, the second largest collection in the world after The Louvre. The National Museum of China; The Met; and the Vatican Museums round out the top five, in case you wondered. This first morning dawned…sunny! We put ourselves together and hurried to the morning meal. Breakfast is the one meal I seldom look forward to at home because all of us take a different approach to the start of the day, so it’s either three preparations or someone is left unsatisfied. When we travel, though, I can have salmon and cucumbers; Tony can have fried eggs and bacon, and everyone is happy. No need for the former, and most glad I brought the latter. Memorable Moment #3 occurred in the Metro system. My rusty Russian could only get us so far; in making transfers we would have to stop and decipher the maps. On one occasion, though, Anna Grace hopped onto the Metro and the train departed, leaving Tony and me on the platform still looking at the map! Throughout our travels across Europe and Japan (especially Japan!) the “Family Separation Rule” has always been to exit the train/tram/bus at the next stop and wait for the family to catch up. The rule was perfectly executed that night! Some of Moscow’s Metro stations are famous for their designs, so Anna Grace and I made a point to visit Mayakovskaya, famous not only for its 30+ themed-ceiling mosaics of “The 24-hour Soviet Sky” but also because the station, owing to its depth of 33 meters below ground, served as the residence for Joseph Stalin during WWII. The station did not fail to impress. Sometimes the answer was obvious. The McDonalds sign, in Cyrillic. No McBlini offered inside, sadly, just the usual fare. No red octagons in Moscow! 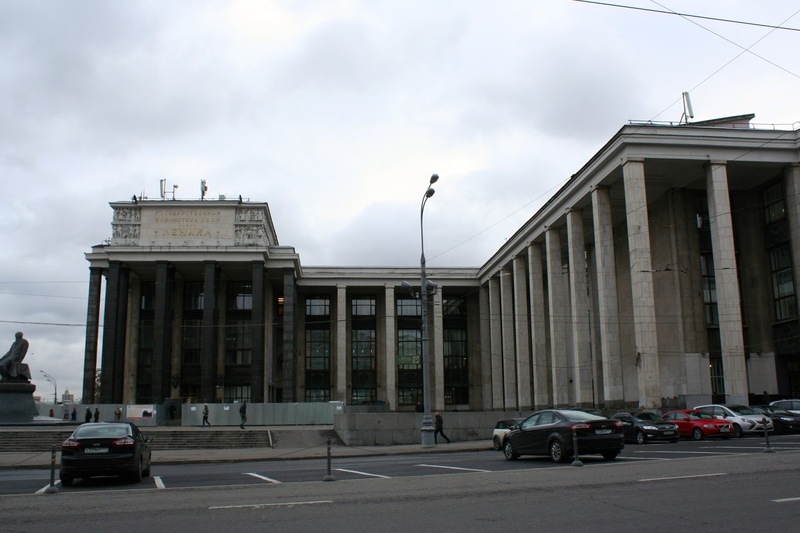 The Bolshoi. By the time I thought about tickets for a performance, everything was sold out. Next time. 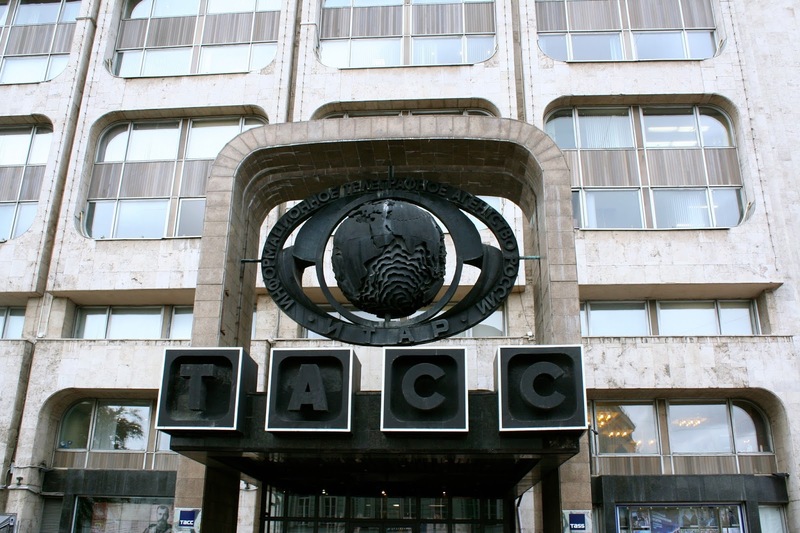 TASS, the Russian news agency building. Hideous, isn’t it? Perhaps not as hideous as this official building, though. The marble tiles on the left columns are falling off; the entire area is off limits for pedestrian access. Oh, the irony. Glorious, glorious fur was everywhere, too. On the young, on the old, on men, and on women. On everyone. 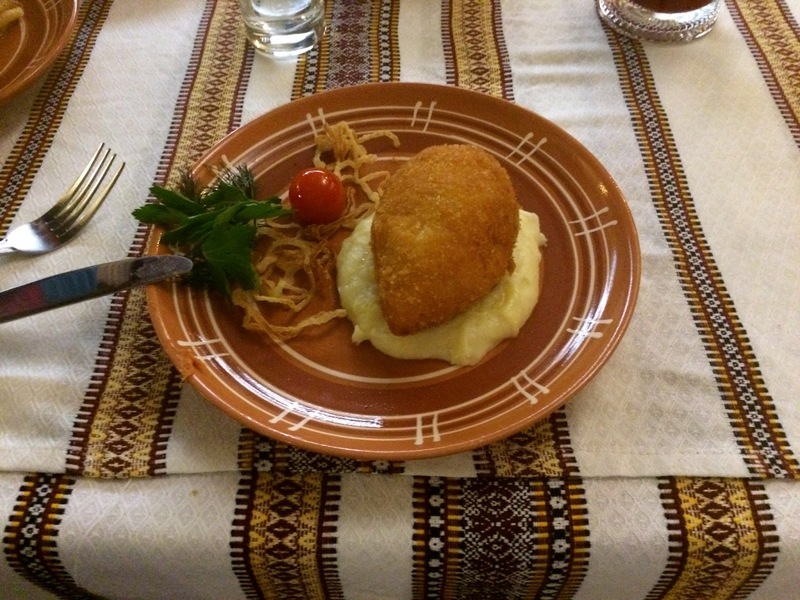 Because I prepare Polish cuisine at home often, and Polish and Russian foods share many similarities, eating Russian cuisine was not a priority on this holiday. 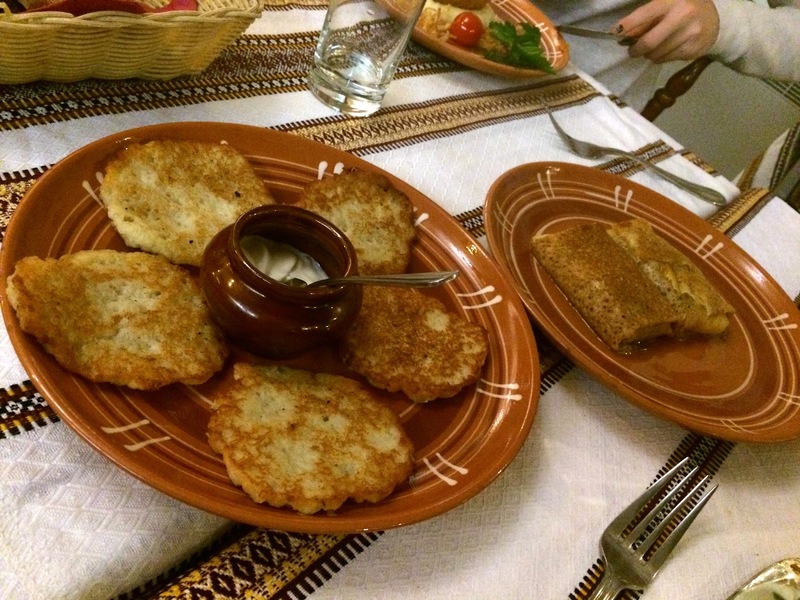 Though, for one grand meal, the Blinis, potato pancakes, garlic-roasted pressed chicken, Pelminis, and a perfectly-presented Kiev filled our table. 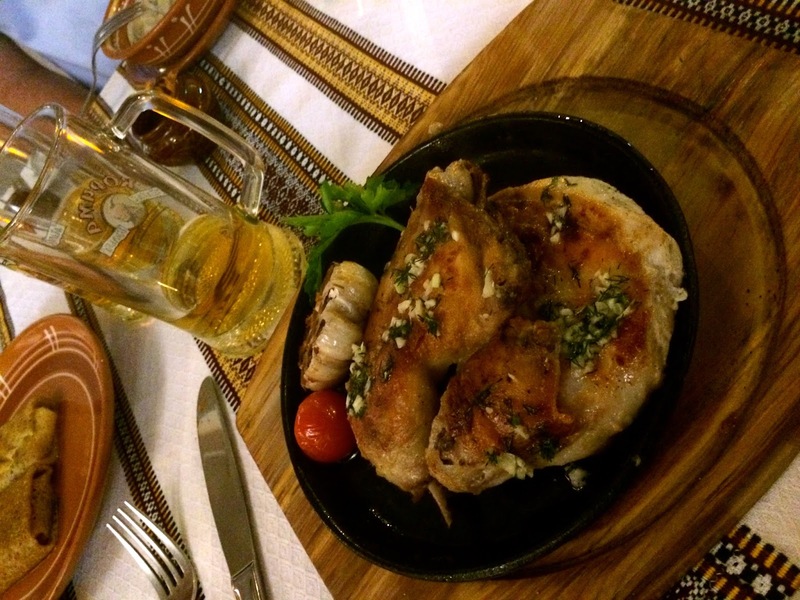 No converting the Rubles to Euros for this dinner! On our final night we passed a Russian/Argentinian steak house. Imagine. Tony savored a rare Rib Eye, declaring it the finest he has had this side of the pond; while Anna Grace and I went with steak burgers, wonderfully reminiscent of those in America. 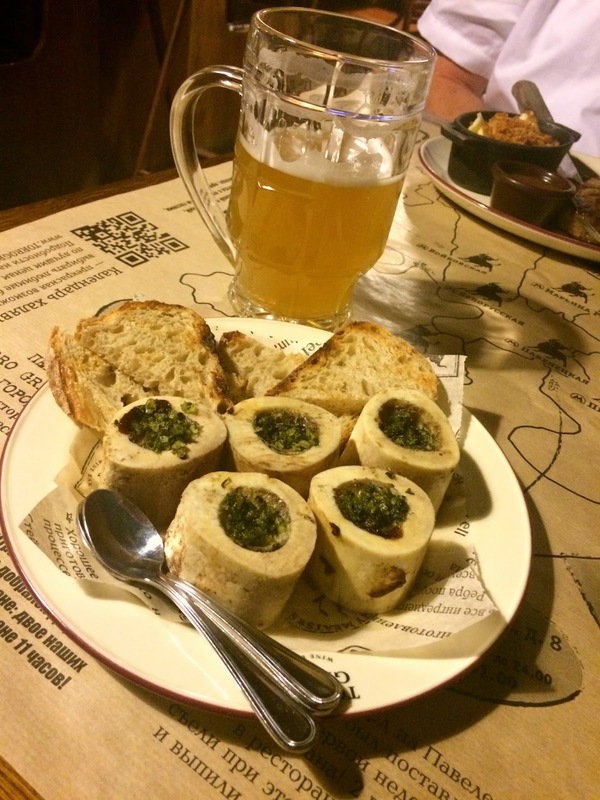 Oh, and a starter of garlic and herb-roasted bone marrow. Oh. My. Goodness. I can not wait to explain to my Viennese butcher what I plan to do with the next round of marrow bones I purchase! While we enjoyed snow and Memorable Moments throughout our visit, the Epic Eye Rolls were entirely concentrated on our departure. Upon check-in, I handed the Aeroflot agent our (American) passports. From that moment she proceeded to ask us each question first in Russian, wait for our blank stares, and then roll her eyes before stating a couple of English words in the form of a question that we could understand. I asked Anna Grace to watch the tags she was placing on our luggage, lest she send our bags to Vietnam and not Vienna, just for fun. When Tony asked for an exit row seat, we thought her eyes would roll out of her head. Passport control to leave Moscow was unlike any we have ever encountered. Queues were merely suggestions; the elderly felt it appropriate to walk to the front of any queue they desired, and it seemed many others were playing, “Let’s Make a Deal” for a better spot in the line. Eventually it was our turn, and I placed our passports across the window to the Passport Control Officer. The Epic Eye Roll ensued once more, and if only I could have captured the eye roll on video, it would be a viral GIF by now. 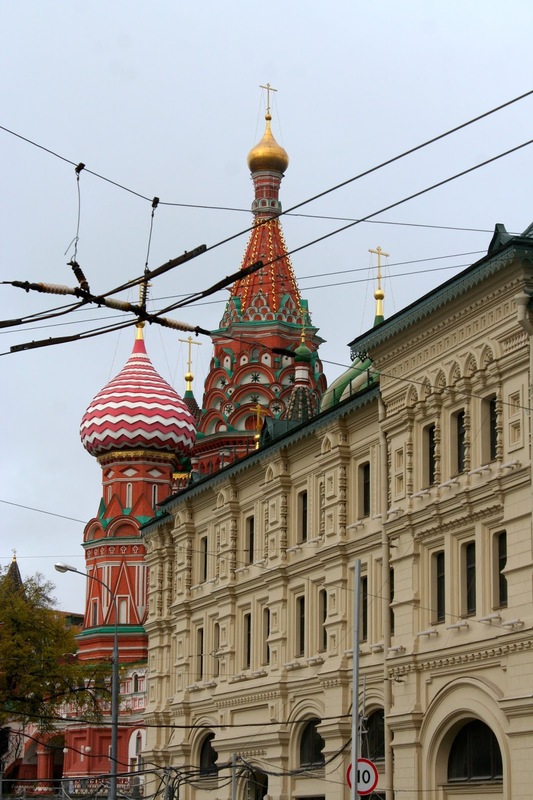 Moscow is home to more than 900 churches. A bit like Rome, we thought, and so we decided to focus on St. Basils Cathedral and drop in on any others of interest. St. Basil’s is every bit as pretty on the inside, with frescoed, maze-like passages and small exhibits tucked here and there. This is the story of the Tsardom of Kazan, now the capital of Tatarstan, one of the small republics in the southwest of Russia. The writing was beautiful to look at. A pewter-hammered overlay for the painting, a la Romanov style. A close-up of the tiles that create the iconic onion domes of the cathedral. 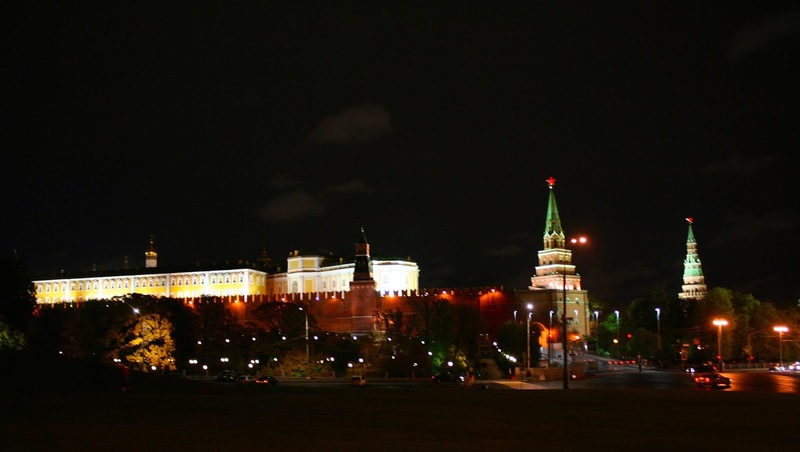 Within the Kremlin is the Cathedral Architectural Complex, and seven magnificent churches to explore. 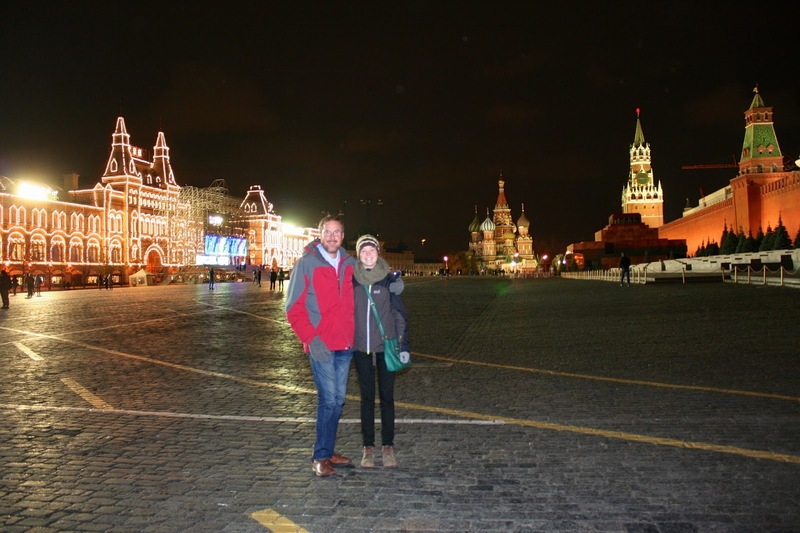 Roaming the city as we did gave occasion to spy onion domes and churches in an array of colors, too. By our account we counted almost 30 onion-domed churches. Only 850+ to go for our return visit! Memorable Moments. Epic Eye Rolls. And Snow. Moscow! This all-too-brief holiday was a long time in the making. Even having an official travel invitation from the Russian government does not necessarily mean the visa process will go smoothly, who knew? I can only wonder what hassles await those with Tourist Visas! By the time we reached the Tatras over Poland on our departure day, though, all fretting was over. Moscow, here we come! Feeling rather confident the rusty Russian I used in Kiev (yes, yes, I know the languages are different) would be of some use in Moscow was short-lived by the time I reached the Bankomat at Sheremetyevo Airport. Thankfully Armen, our awesome Armenian airport driver guided me through these first moments of extracting Rubles in Russian. In the car Armen’s stories and narratives made us laugh, and, perhaps more importantly, distracted us from the 75 minute slog in scary traffic to our hotel. The first evening was a blur; by the time we reached our hotel and settled in all interest in going back out was lost. Except, we hate hotel restaurants so out we went to forage for dinner, and found a combination Sushi Bar/Mexican/Italian/Russian place that was jam packed with locals. The decision turned out to be a great idea, as the food was excellent! The next morning, buoyed by the hotel breakfast of Congee and pickled herring (do not judge me) and armed with map, guidebook, and travel documents we bid Tony “Do Svidaniya,” heading to the Kremlin to start our sightseeing. Riding Moscow’s Metro is not for the easily intimidated or the agoraphobic, and we had to stop and decipher the stations (no English signs in Moscow!) with each connection. But we made it. Alexandrovsky Sad, the expansive and beautiful garden adjacent to the Kremlin. How big is the Kremlin? Judge for yourself! Memorable Moment #1 occurred as we were entering the Kremlin (and pretty much every museum and public building of interest). “Do you have knife?” was the one and only question asked as we passed through security and our bags were investigated. It was hard not to laugh. We toured first the Armoury and Diamond Fund, which house the former Imperial treasures (and then some!) and made “our” little Habsburg Treasury here in Vienna look like a kiddie-collection. The Romanov’s were hands down the original Beadazzlers. Crowns with fur! A map of Russia made of diamonds! Overlays for paintings comprised of gems in every color of the rainbow! Decorated sleighs and carriages that would inspire even the most ardent feminist to wish for a prince! And of course, the pretty, pretty Faberge collection. Small wonder there was a revolution. And, absolutely no photos permitted. Thankfully, an exhibit at GUM (the former state-run department store) on Russian winter fashions featured very good replicas of the crowns. How fancy I would look, wearing one of these on my morning outings with Clayton Theodore! View above the Moscow River from the Kremlin grounds. Those would be the snow clouds that tagged along with us on this holiday. Also visible from high atop the Kremlin grounds is the Cathedral of Christ the Saviour. In 1931 Lenin ordered the original church on the sight demolished, though some of the marble was repurposed into Moscow’s Metro stations. The large remaining hole eventually filled with water, which Khruschchev thoughtfully transformed into the Moscow Pool. After the dissolution of the Soviet Union, funds were collected and permissions granted to rebuild the church, now the tallest Orthodox Christian Church in the world. No irony there. 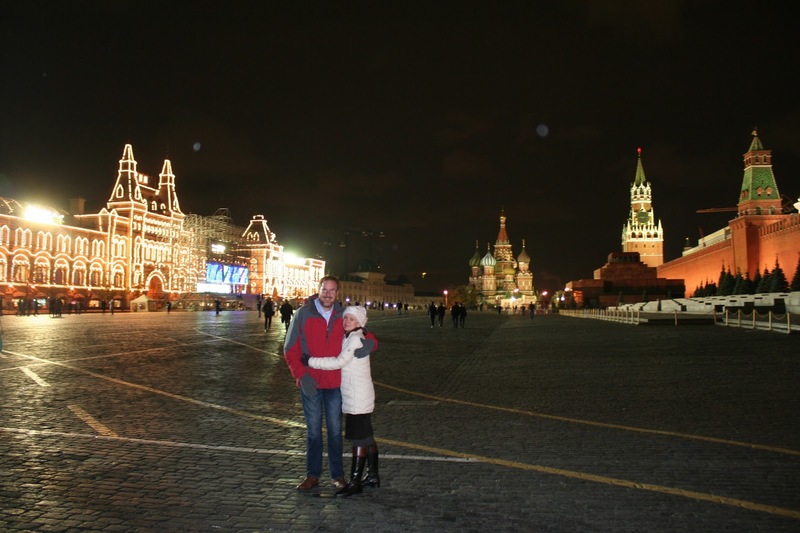 Memorable Moment #2 happened in the Architectural Complex of the Kremlin. I was whistled at by a handsome Politsiya! But not for the right reasons. In attempting a better photo angle of the church below, I inadvertently stepped off the unmarked tourist pathway and was swiftly reprimanded. Oops. Approaching from the west side of the Kremlin, one sees first the state historical museum. 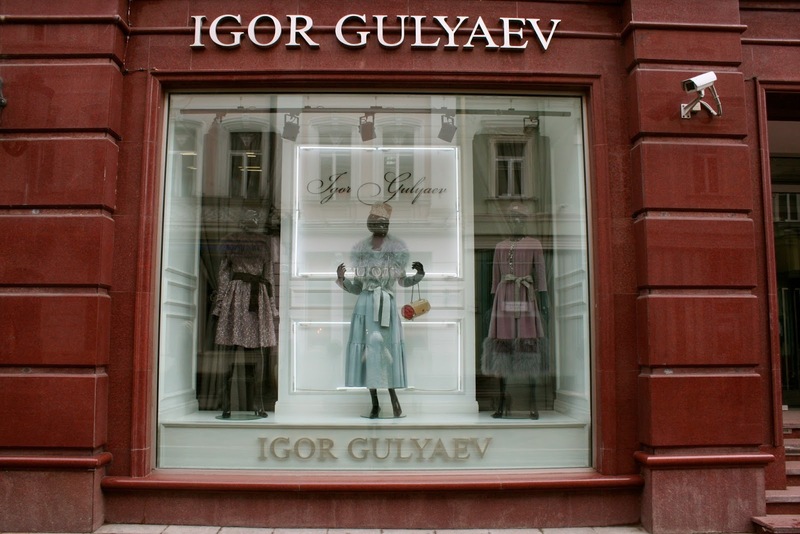 Inside Red Square, which is really more of a Red Rectangle, and opposite the Kremlin, the GUM (Glavnyi Universalnyi Magazin), the former state-run and now terribly high-end department store. The front of which was covered in scaffolding, thus meeting our travel requirement that at least one important structure in any major European city we visit be covered. The interior of GUM feels like a dozen Parisian passages, all warmly lit from the light coming through the glass roof. In front of the Kremlin is Lenin Mausoleum. No interest in dropping the Rubles to see the dead leader, so we took a pass. Following dinner on our second evening Anna Grace and I gave Tony a personal tour of Red Square, expertly navigating the Metro, too! The Kremlin and the grounds were closed for the day, but the lights shining on the Kremlin keep the visual alive well into the evening.